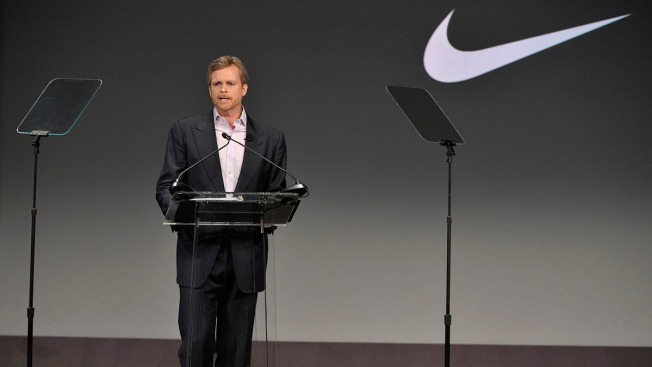 In this file photo, President & Chief Executive Officer, Nike, INC. Mark Parker attends the unveiling of a new initiative called 'Let's Move Active Schools' to help schools create a physical activity programs for students at McCormick Place on February 28, 2013 in Chicago, Illinois. A group of former female employees at Nike Inc. are suing the company over allegations that it "intentionally and willfully discriminated against [women] with respect to pay, promotions, and conditions of employment," according to the lawsuit filed Thursday in the U.S. District Court in Portland. The complaint, which seeks class-action status, is led by former employees Kelly Cahill and Sara Johnston, who worked at the company's Beaverton, Oregon, headquarters and are both currently at rival Adidas. They paint a picture of a corporate culture that systematically discriminated against women, fostered a hostile workplace and even tolerated or ignored sexual assault, according to the lawsuit. Nike didn't immediately respond to a request for comment. Here's what seven experts are saying about Tesla potentially going private from CNBC. "Women's career trajectories are blunted because they are marginalized and passed over for promotions. Nike judges women more harshly than men, which means lower salaries, smaller bonuses, and fewer stock options," the lawsuit reads. "Women's complaints to human resources about discrimination and harassment, including sexual assault, are ignored or mishandled." Complaints first surfaced at Nike in March when a group of women presented CEO Mark Parker with a survey on gender discrimination. Then-President Trevor Edwards, who was being groomed to be a possible successor to Parker, was blamed in the lawsuit for creating and exacerbating a "hostile work environment." Parker quickly restructured his leadership team and announced that Edwards would retire in August. The company also admitted it failed in hiring and promoting women, ousted at least 11 executives and announced raises for 7,000 employees after conducting an internal review of its pay practices. The CEO apologized to employees in May. "We, and I, missed something. While many of us feel like we're treated with respect at Nike, that wasn't he case in all teams. And if all of ours teammates don't see the same opportunities, we just can't accept that," he said at the time. In the lawsuit, Cahill cites a culture where women felt excluded, were subject to hostility and were referred to in demeaning ways. She resigned from Nike in 2013. Cahill says she voiced her complaints to human resources at least four times to no avail. "For many women at Nike, the company hierarchy is an unclimbable pyramid - the more senior the job title, the smaller the percentage of women," the suit reads. "Women's career trajectories are impacted because they are marginalized and passed over for promotions." The group is seeking changes in company pay practices, a court-appointed monitor, back pay and an unspecified amount of punitive damages. "The way Nike marginalizes women at its headquarters is completely contrary to how it portrays itself to its customers as valuing women in sports and the importance of providing equal opportunity to play," said Byron Goldstein of Goldstein, Borgen, Dardarian & Ho, which is representing the women. Meanwhile, Nike's stock has not seen any material impact. Nike's stock price is trading near its all-time highs. CNBC's Nick Wells contributed to this article.